Julian May lives in Washington state and has been writing science fiction and fantasy for more than thirty years. The Saga of Pliocene Exile — (1981-1984) Publisher: This is a spellbinding tale woven of equal parts epic and myth — with a liberal dash of hard science fiction. When a one-way time tunnel to Earth’s distant past, specifically six million B.C., was discovered by folks on the Galactic Milieu, every misfit for light-years around hurried to pass through it. Each sought his own brand of happiness. But none could have guessed what awaited them. Not even in a million years. In the early twenty-second century, many humans are being born with psychic powers and are linked in a single galactic mind. Those without these psychic powers — the misfits, undesirables, criminals, and radicals — have a choice: mental reprogramming or exile. Exile, voluntary or otherwise, takes them back six million years, to a time between the extinction of dinosaurs and the rise of Homo sapiens, and to a time of exotic surprises and unknown dangers. 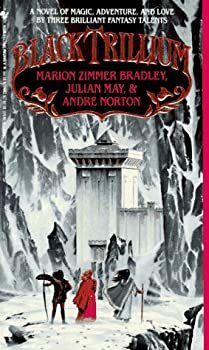 The Many-Colored Land: Blackstone, please put the sequels on audio! 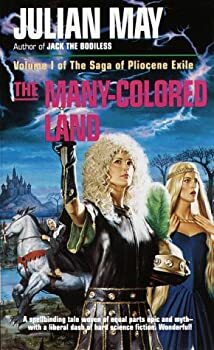 The Many-Colored Land, a classic (1981) science fantasy novel by Julian May, wasn’t too high on my TBR list until I noticed that Blackstone Audio released it last month and I remembered that Thomas Wagner recommended it. I like science fantasy, so I gave it shot, and I sure am glad I did. I loved every moment of The Many-Colored Land and my only disappointment is that the rest of The Saga of Pliocene Exile is not available on audio. The Galactic Milieu — (1987-1996) Prequel to The Pliocene Exiles Saga. The first two novels, The Surveillance and The Metaconcert were released as the omnibus Intervention in the UK. Publisher: For 60,000 years the five races of the Galactic Milieu have waited for the time when human mental development on Earth is ready for intervention. As the 20th century draws to its end, phenomenal mental powers are displayed by “operants” on Earth. One of these is Rogatien Remillar, book dealer. Boreal Moon — (2004-2006) Publisher: The four kingdoms in the Boreal Sea that have clashed since time out of mind. But Prince Conrig of Cathra — who waits patiently as his father, the king, slowly dies — is in league with his lover, the seductive sorceress Princess Ullanoth of Moss. And if their secret alliance succeeds, the warring kingdoms will be united once and for all — under the iron hand of one supreme rule. CLICK HERE FOR MORE TITLES BY JULIAN MAY.